I received this suggestion on [tag]basketball rebounding drills[/tag] from Steven. It’s a variation of the Sumo box out [tag]drill[/tag]. My girls love this [tag]basketball[/tag] drill. 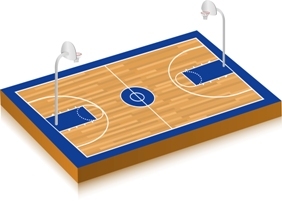 One player is at the free throw line facing the basket and another behind her facing the other basket. When I blow the whistle the player behind has to spin around and try to get to the basket while the girl facing the basket tries to box her out. I use the key as a boundary. Tip: When dealing with “kids with attitude” I have a method that works very well. If I see a player getting an attitude or getting very angry on the court during a game, I point at them and they have to stop and do 2-3 jumping jacks right where they are or I pull them from the game. It has worked great with kids who have anger management problems on and off the court.